The wisdom of Stephen Hawking won’t just live on in memory, but will be beamed into a black hole so that it might exist in other capacities or be destroyed immediately — depending on which theorist you ask. The ashes of the late physicist, who died March 14 at the age of 76, will be buried between the remains of Charles Darwin and Isaac Newton following a Friday memorial service. While his physical remains will be earth-bound between two other renowned scientists, his voice will be blasted 3,000 light years away to binary system 1A 0620-00, the nearest black hole to Earth. The recording, set to an original piece of music by the Greek composer Vangelis, will be broadcast into the binary system and serve not just as moving tribute, but as an interesting thought experiment. 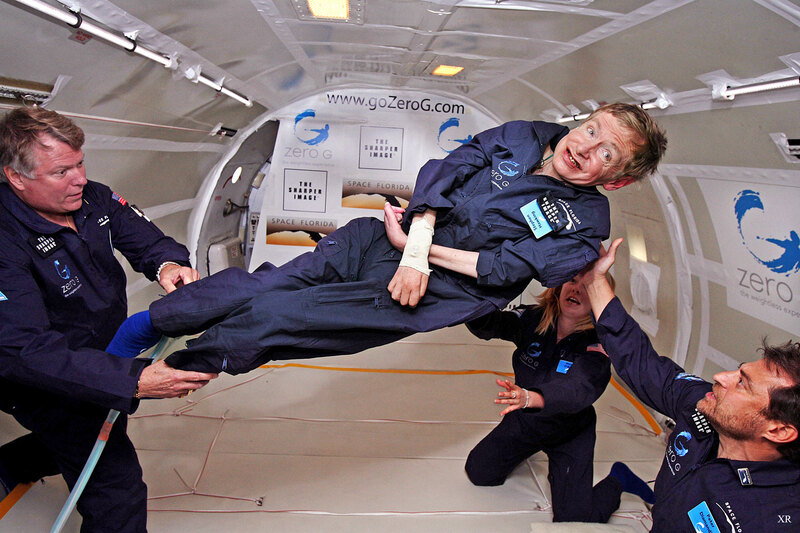 Stephen Hawking floating in 2007. Some of Hawking’s most important work explored the nature of black holes. In 1974, he famously presented how black holes emit radiation, which was contrary to belief at the time. Hawking’s final interview offered new insight on the creation of black holes after studying the gravitational waves formed by the merging of neutron stars, a possible way black hole are formed. According to Hawking, if a particle falls into a black hole, the black hole will lose a bit of mass in the form of energy. Black holes radiate small amounts of energy and evaporate over time. Logically, if something falls into a black hole, it will be lost. This creates the information paradox. Scientists still aren’t sure if information inside a black hole is preserved or lost forever, but a recording of Hawking’s voice, much like his work, could one day help carry that research forward. Physicists continue to search for evidence of “Hawking radiation,” a theoretical type of energy that is thought to radiate from black holes as a result of quantum effects. Finding evidence of this would help scientists decide whether black holes truly destroy all information within them, including the recording of Hawking’s voice after it’s beamed into 1A 0620-00 on Friday. According to his daughter, Lucy Hawking, the space delivery is “beautiful and symbolic gesture that creates a link between our father’s presence on this planet, his wish to go into space and his explorations of the universe in his mind.” Even if we never hear that recording emitted from a black hole again, it’s only fitting that Hawking shall be remembered through a new experiment without an end in sight.